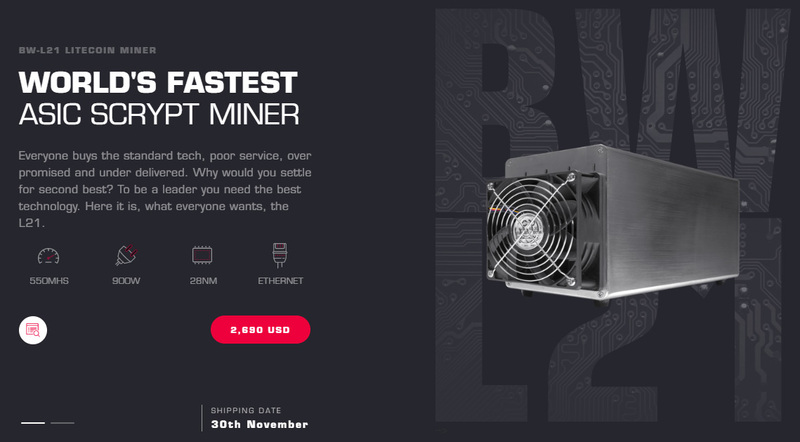 You can currently order the 550 MHS BW-L21 Litecoin ASIC miner from HyperBit at a price of $2690 USD in single unit quantities and get it delivered worldwide with a shipping set to start on 30th of November for the current batch of miners. The L21 is apparently the current leader in terms of performance Litecoin Application Specific Integrated Circuit (ASIC) miner on the market with 550 MHS hashrate and with just 900W of power usage. It is not clear what the situation with the power supply is at this point however, is there one included (no mention), but a PSU does appear on one of the product photos. Most likely you would need to buy the PSU separately, one that does provide at least 1000W of power and comes equipped with at least 6x 6-pin PCI-E power connectors. Do note that all orders are being shipped directly from the manufacturers location – Shenzhen, China.